Candidates can apply offline for the released ZP Hassan Recruitment 2018 from this page. 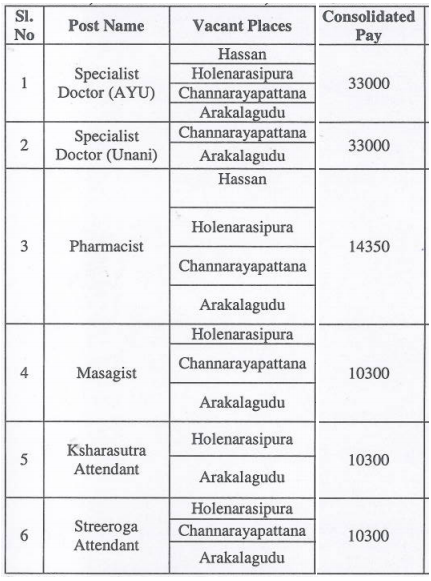 And also the officials of the Zilla Panchayat Hassan (ZP Hassan) had invited the Applications for the 24 Specialist Doctor (AYU), Pharmacist, Specialist Doctor (Unani), Ksharasutra Attendant, Massagist, Streerogra Attendant Vacancies available at their department. And for that purpose, you need to know the complete information regarding the ಜಿಲ್ಲಾ ಪಂಚಾಯತ್ ಹಸನ್ Job Openings 2018 from the current page. The application process had started recently and will end on 10th October 2018. And we have provided you with the clear eligibility criteria, application fee, applying method together with the hassan.nic.in Consolidated Pay, the critical dates for the ZP Hassan Vacancies 2018. Also, we inserted the proper for the Official ZP Hassan Recruitment 2018 Notification PDF and the Application Form download at the end. Check the below-given requirements which are in need to be satisfied by the applicants under the ZP Hassan Recruitment 2018. Specialist Doctor (AYU) – Candidates should have the PG Degree in Ayurveda. Specialist Doctor (Unani) – Competitors should have the PG Degree in Unani. Ksharasutra Attendant – Should have the minimum SSLC qualification and also the working experience in AYUSH Hospitals/ Dispensaries. Massagist – Applying candidate should have completed heir 7th Standard and the working experience in AYUSH Hospitals/ Dispensaries. Streerogra Attendant – All the applying aspirants, should have the minimum SSLC qualification and also the working experience in AYUSH Hospitals/ Dispensaries. 38 years for CAT-1, 2A, 2B, 3A, 3B contestants. And 35 years for General Category candidates. Look at the following table to get the Consolidated pay given by the officials of the ZP Hassan to the selected candidates under the ZP Hassan Recruitment 2018 process. There is no such fee to be paid for the ZP Hassan Recruitment 2018. So, if there is any update regarding the Application Fee, then we will soon update you in this page. A committee will make the selection, and appointment for the ZP Hassan Recruitment 2018 presided the Honorable District Commissioner. So, there will be only the Interview session. Those who are ready to apply for the ZP Hassan Recruitment 2018 should check the below steps to move accurately. Navigate to the official site of the Zilla Panchayat Hassan (ZP Hassan) @ hassan.nic.in. In that home page, search for the NOTICES section visible on the right top of the home page. Then, click on the “Recruitment” section on the drop-down list. So, you will be redirected to the new page. Then click on the first link that holds the notification of the ZP Hassan Recruitment 2018. Download the Application form too and then fill it. Remember, you must submit it before the end date. Hope all the given information regarding the ZP Hassan Recruitment 2018 is useful to the aspirants. 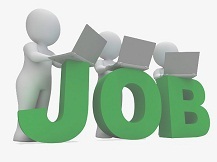 So, stay tuned to our Sarkari Recruitment website to get the latest stuff.